Catch Angela tonight in Lifetime’s Terror in the Woods! You can watch the trailer and find out more about Terror in the Woods here. Wishing this beautiful lady a wonderful birthday! 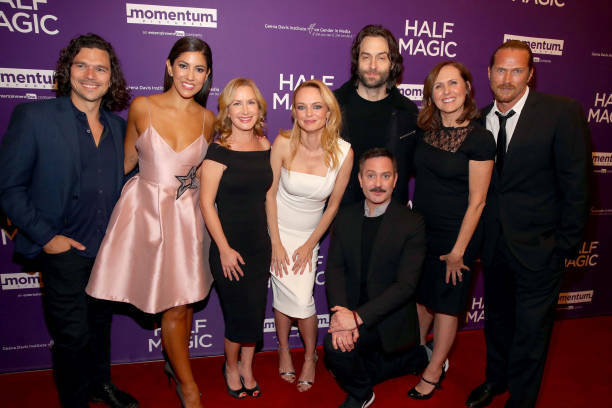 Angela at the premiere of her latest film “Half Magic,” which stars and is written and directed by Heather Graham. “Half Magic” will be in theaters starting tomorrow! 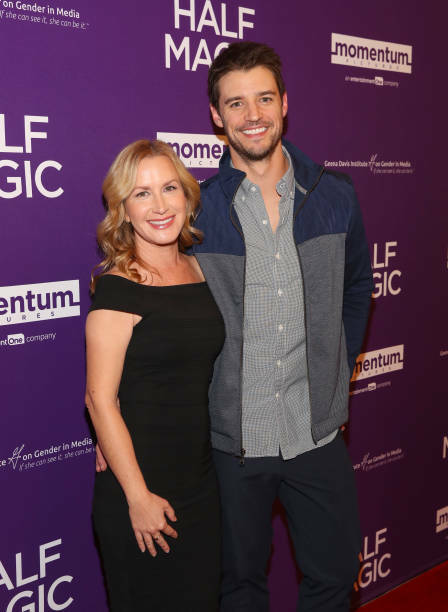 Angela Kinsey, clad in a striped black and white sweater, skinny jeans and beige boots, strode onto the stage at Blackman Auditorium Tuesday night. As she eased into her chair, she realized it was too far from the table in front of her. “Short girl probs [problems],” she said as she laughed and scooted her chair closer to the table. “I know [of] Angela from The Office…I’m really excited to see her,” fifth-year psychology major Devon Carleton said. As soon as the doors opened, people rushed into the rows and completely filled the auditorium within minutes. Once the lights dimmed and Kinsey appeared on stage, many audience members cheered and straightened up in their seats. Media and screen studies assistant teaching professor Kristopher Cannon moderated the discussion. Kinsey began by saying that she didn’t find herself too similar to the character she played in “The Office,” Angela Martin. “I don’t think I’m that much like my character, except I do have two cats…and basically I love animals,” Kinsey said. However, one way Kinsey said she is similar to her character is that she often has a bored expression on her face, even when she is feeling happy. Kinsey was amiable throughout the talk, as demonstrated by her eagerness to answer all the questions students had to ask. One student, during the question and answer period after her talk, asked Kinsey which character other than Angela she would like to play in “The Office”. Kinsey also spoke about some of her fondest memories of the show. Many students were pleasantly surprised by Kinsey’s warm demeanor, which contrasts sharply with the character she plays in the show. Though Kinsey kept the audience smiling and laughing the whole night with behind-the-scenes stories and interesting details about the rest of the cast, she also made sure to address more serious issues. One such topic was women’s roles and representations in the media and film industry. Kinsey said women like Morrison and Mindy Kaling — another actor on “The Office” and writer of “The Mindy Project” — are so empowering. “There were many times when you would walk into a writers’ room and it would be all men and maybe one gal, and that is definitely changing,” Kinsey said. One attendee, second-year theatre major Somaiya Rowland, said she was inspired by Kinsey emboldening more women to write. Rowland was among many students who were encouraged by this. “Angela telling us we need to ask ourselves ‘why not me’ was such an inspiring way to build confidence and forward momentum,” she said. Before Kinsey left the stage, she gave some behind-the-screen information about the season five episode, “Stress Relief.” In one scene, Angela Martin clutches her cat, Bandit, while the office is on fire. All the employees are running around, and when another employee, Oscar, climbs up into the ceiling, Angela Martin shrieks, “Save Bandit!” and tosses the cat into the ceiling. “The crew told me, ‘You’re going to take the cat, swing it back, and when you get up [to a certain point], you’re going to stop,” Kinsey said. Kinsey said that right after this, she was to move out of the frame, so a stunt double could gently put the cat into the ceiling. Someone was hiding up in the rafters to catch the cat, while another person with a fake cat was going to throw it out the other side. To make sure nothing went wrong with the scene, Kinsey said the cast “rehearsed [it] like a choreographed dance” to get it in one take, and that “everyone was screaming and running,” but also having a great deal of fun. Unfortunately, things didn’t go as planned. The producers cut the part where the fake cat fell out, and audience members were both mortified and amused to realize that it was the real cat accidentally falling out of the ceiling. Some audience members said this was their favorite part of the night. “I’ve always wondered if the cat in the ‘Save Bandit’ scene was real, and now I know that it was a real cat that fell out of the ceiling,” Lamar said. The conversation with Kinsey was both greatly entertaining for attendees and very inspirational, empowering them to follow their passions and dreams despite difficulties. Even though NBC’s hit comedy The Office ended two years ago, that doesn’t mean the cast isn’t still friends. Also, it isn’t going to keep at least part of the cast away from awards shows. On Sunday, Jenna Fischer and Angela Kinsey reunited at the Emmys. To be clear, they didn’t attend the awards show itself, but they did hit up the after parties and you know Michael Scott was feeling left out. Fischer (aka Pam Halpert née Beesly) and Kinsey (aka Angela Martin) are real-life best friends, unlike their characters on The Office, which they proved on Instagram with all of the adorable photos they shared from the Emmys. 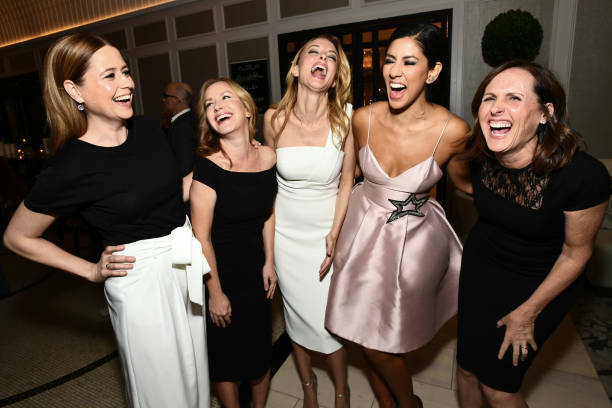 The night before the actual awards show, they hit up some pre-Emmy parties, where they also had some mini-Office reunions. To my fellow Scranton and Dunder Mifflin fans, it’s as glorious as it sounds. If that isn’t enough, on Sunday night they had another Office reunion, which just might make those on Team Jim squirm. That’s right, Fischer met up with David Denman, who played Pam’s former fiancé Roy. Don’t worry, they didn’t look super cozy or anything like that. I’m pretty sure Fischer is still very much dedicated to John Krasinski’s Jim. The stars of the satirical Hulu series “The Hotwives of Las Vegas” have revealed the “Real Housewives” on which they based their portrayals. And one is a shocker – that, gasp, one of the “Hotwives” stars doesn’t watch any “Real Housewives” shows. “Hotwives” launches its second season Aug. 18 on Hulu, which will release a new episode every week. As part of the drumroll, each actress told TV writers which of Bravo’s many “real housewives” she is aiming to capture. PHOTOS: Angela and the cast of ‘The Hotwives of Las Vegas’ during a panel discussion at the Hulu’s 2015 Summer TCA Tour.